Dental Questions: Is Dental Anesthesia Safe? 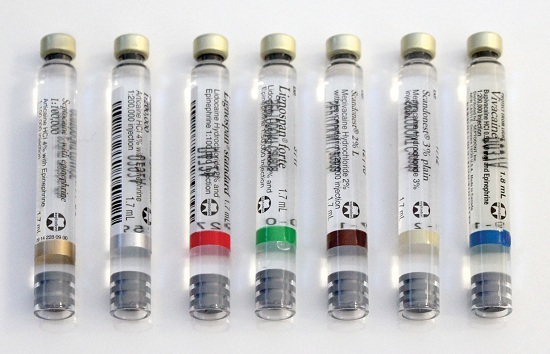 Dental anesthesia is packaged into carpules like these. The sizes and coloring is standardized to prevent any confusion between manufacturers. Note: In this article, we will only be discussing local anesthesia. For information on other forms of anesthesia/sedation, please contact our office. Many patients come to our office with concerns about the safety of "Novocain" and other local anesthetics. Because these medications seem to work so quickly and powerfully, it is no wonder that they raise concerns in the general population. However, we are here to show you how and why local anesthetics are wonderful tools in dental treatment. First off, Novocaine is no longer used in general dentistry. Concerns of liver damage prompted pharmaceutical companies to develop a new generation of drugs. Now, we have products such as lidocaine, septocaine and carbocaine- a variety of compounds maximized for specific circumstances. They are metabolized safely and have predictable durations of numbness. Overall, these medications have very few side effects unless you are receiving large quantities (far beyond the amounts used in dentistry). Anesthetics are frequently administered with epinephrine. This compound is made naturally by the human body and is essential to life. We use it to allow the anesthesia to better numb the intended tissue. Some patients may feel an increased heart rate or anxiety when exposed to epinephrine. However, it is impossible to have a true (medical) allergy to this substance. During exams, we take note of any contraindications or reactions you may have had with epinephrine in the past. This does a great job of minimizing unexpected side effects. In practice, most adverse reactions to anesthesia come from its method of administration. However, good technique and modern equipment (such as our wand systems) help mitigate any problems. If you would like to know more about dental anesthesia and it's safety, please give our office a call!